Be honest—where do you keep your smartphone at night? Is it on the nightstand? Having a smartphone is now an essential part of modern life, and many people wouldn’t leave home without it. And among smartphone makers, Apple is laughing at critics who thought people wouldn’t pay more than $1,000 for a phone. The ubiquity of smartphones and their ever-increasing price tag got us thinking about global inequality—how long do people have to work to afford such an expensive device? We found the data for our visualization from UBS Group, a global investment bank headquartered in Switzerland. UBS looked at how many days someone would need to work in several cities to afford on iPhone. There are two key underlying assumptions. First, you can find different promotions for buying an iPhone at various stores, and UBS did the research to determine the average price in each location. And second, UBS’ calculations are also based on an average workday of 8 paid hours. We decided to make things more interesting by converting the figures to hours. We stack ranked the results of our analysis by the color-coded continent in which each city is located, ranging from high-to-low. This lets you easily see how purchasing an iPhone X can be used to measure the cost of living around the world. The most interesting fact about our visualization is how it demonstrates inequality both within and between continents. In Europe, for example, most of the cities on the left side are in the East, and most of the countries on the right are in the West. 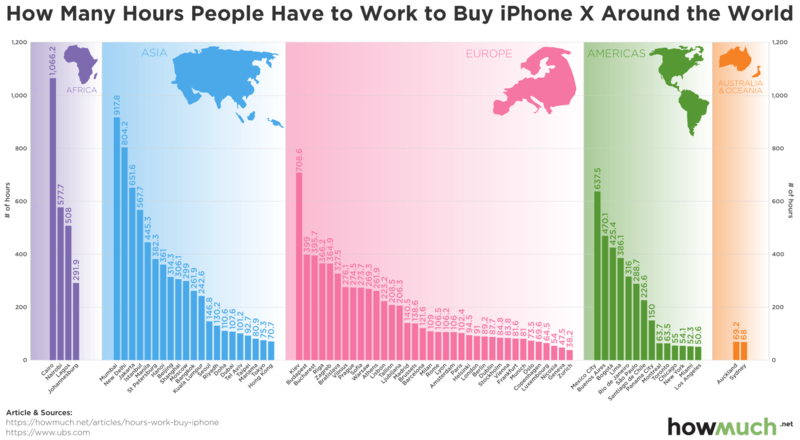 Similarly, in the Americas, workers living in North America like Los Angeles and Miami have a much easier time affording an iPhone X than workers living in Latin America, in places like Lima and Buenos Aires. Now look across the visualization and compare continents. See how many cities in Asia require 200 to 300+ hours of labor before the average worker can afford the iPhone X? That roughly compares to many of the cities in Eastern Europe and Latin America. This is direct evidence confirming something people already know to be true. Apple’s brand appeals to people living in advanced economies where there’s plenty of WiFi and 4G LTE networks. Egyptians living in Cairo would have to work 1,066.2 hours. That’s more than 26 weeks! Clearly not Apple’s target demographic. There’s another insight in our visualization hiding just beneath the surface. On average, people have to work days and days to afford an iPhone, maybe even several weeks. A lot of people get a new phone each year, so let’s extrapolate our visualization into the future. In all likelihood, Apple will get the equivalent of months of labor over the course of the average person’s lifetime--maybe even years of labor-- in exchange for a smartphone. And here’s the thing: people camp out for days to be the first to buy Apple’s products. Clearly, Apple is delivering on its brand.